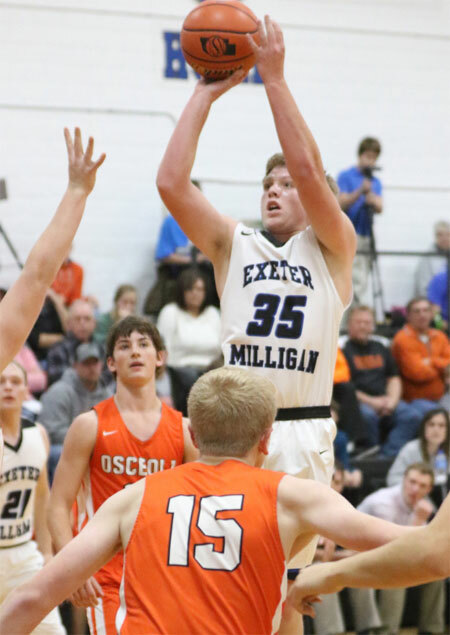 State-ratings contender Exeter-Milligan has opened its season with a pair of wins. The 2-0 Timberwolves downed Deshler on the road 48-45 on Thursday and rolled past Osceola 50-27 at home on Friday night. E-M trailed Deshler 24-20 at intermission. The Timberwolves dominated the third period 11-3. Max Zeleny scored 10 points for the winners, while both Jackson Beethe and Colton Bossaller added nine. Spencer Pribyl netted eight points and snagged nine boards. Mitchell Manning scored seven points. Zeleny had 10 rebounds and Beethe had nine boards. Pribyl led all scorers with 17 points against Osceola. Zeleny added 11 points and Bossaller put in eight. Johnny Babula powered in six points and Beethe had five. Trevor Zelenka netted three points against the Bulldogs. E-M will need to replace 60 percent of its offense from a season ago—where the Timberwolves finished 20-6 and a win away from qualifying for State. Zeleny, a 6-0, all-around threat, averaged 8.3 points and 8.6 rebounds a year ago. Pribyl, a 6-3 post, figures to be a presence in the lane this season.